CycleSafe provides secure long-term and short-term bike parking solutions to comply with CALGreen Bicycle Parking Regulations. At CycleSafe, we work with architects, engineers, contractors, and building owners to meet CALGreen secure bike parking regulations. The comprehensive CALGreen building code was established to promote health, safety, and general welfare by enhancing the design and construction of buildings through building concepts that reduce the negative impact or have a positive impact on the environment. Part of the California Green Building Standards Code, or CALGreen, bicycle parking regulations dictate building code requirements for secure short-term and long-term bicycle parking for new construction or building additions. CALGreen short-term bicycle parking regulations call for bike racks with bike parking that dedicates 5% of the parking stall count to bicycles. CALGreen long-term bike parking requires secure bike parking for building tenant occupants, typically employees or residents, as opposed to transient visitors. Long-term CALGreen bike parking must be accessible from the street and covered and lockable, or inside permanently anchored lockable bike lockers, or in lockable bike rooms with permanently anchored racks. CycleSafe offers a wide range of CALGreen compliant bike parking options including bike racks, bike lockers, bike shelters, and more. CycleSafe’s CALGreen compliant bike lockers and bike rack are compatible with LEED alternative transportation credits if your facilities meet all the criteria to capture LEED points. CycleSafe Bicycle Lockers provide the highest security, CALGreen compliant, long-term bike parking solutions with protection from theft, vandalism, and weather. Our durable, virtually indestructible bike lockers are compression molded with non-corrosive, rust free, impact resistant, structural-grade composite materials and finished with graffiti/UV resistant polyurethane enamel paint. Install them at your new building sites for the proven, lowest cost of ownership over long-term use, with a life span measured in decades, not years. CycleSafe offers a wide range of both long-term and short-term, indoor and outdoor bike racks to comply with CALGreen standards and meet cyclists’ convenience and security needs. That includes commercial bike racks and bike stalls for short-term, outdoor parking and vertical and two-tier bike wall racks and stands for long-term, indoor parking. We select product materials for long lasting durability and sustainability, including leading edge-coating technology for maximum corrosion and impact resistance, designed for decades of use. 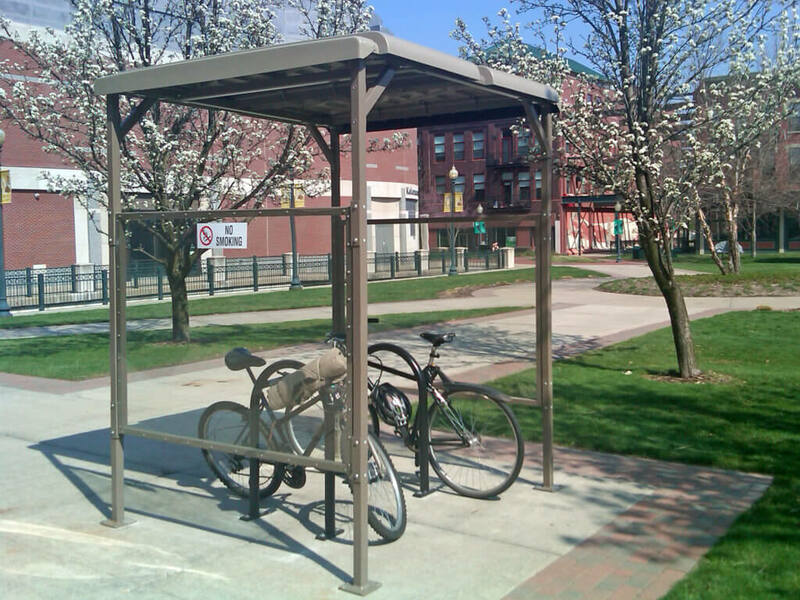 Bike shelters combine with our bike racks to meet CALGreen Class II bicycle parking for four to ten bikes per unit with covered protection. Contoured, compression-molded tops facilitate runoff and heavy-gauge steel tubing support frames protective polyester powder coat finishes. Add wire, mesh, or Plexiglas side panels for additional protection from the elements.